Sorry... the 2017 Buick LaCrosse is no longer being sold as new. Instead, take the first step to a great deal on 2019 Buick LaCrosse with a free price quote! 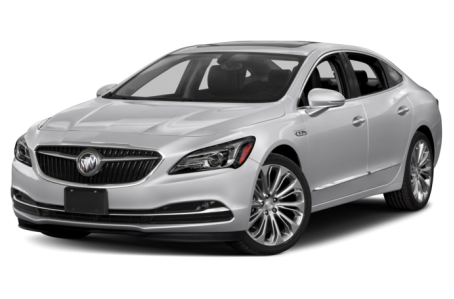 The 2017 Buick LaCrosse is a full-size, premium sedan. It competes with the Cadillac CTS, Lincoln Continental, and Volvo S90. This year, it has been given a complete redesign that includes makeovers to its appearance, platform, powertrain, and suspension. The LaCrosse is the first vehicle in the lineup to wear the new colorized triple shield emblem. It has a sleek exterior with understated, executive styling. The front grille features vertical slats that are framed by a chrome trim. Long, horizontal chrome bars stretch across the grille and lower fascia for a more premium look. The rear fenders bulge out, giving the sedan a muscular appearance as well. Active lower grille shutters will automatically open and close depending on driving speed for better aerodynamics and fuel efficiency. Standard features include Xenon HID headlights with LED signature lighting, front fog lights, power/heated side mirrors with turn signal indicators, a dual-pipe exhaust system, and 18-inch aluminum wheels. Adaptive headlights, a rear spoiler, a panoramic moonroof, and larger 20-inch aluminum alloy wheels are available as well. Under the hood, the LaCrosse is powered by a new 310-hp, 3.6-liter direct injection V-6 engine mated to an 8-speed automatic transmission and front-wheel drive. All-wheel drive is available for the Premium trim. Fuel efficiency for the LaCrosse is an EPA-estimates 21/31 mpg city/highway. It slightly lowers to a 20/29 mpg rating for the AWD model. Inside, the LaCrosse has a premium leatherette interior with front bucket seats and a 60/40 split-folding rear seat. The center stack features a standard Buick IntelliLink multimedia system, which includes an 8-inch touchscreen, Apple CarPlay/Android Auto compatibility, Bluetooth connectivity for phone and audio, and two USB ports. It can be upgraded with an integrated navigation system, OnStar 4G LTE connectivity with Wi-Fi hotspot, and a Bose premium audio system. Standard features include dual-zone automatic climate control, power front seats, remote keyless entry, cruise control, and ambient lighting. Available features leather upholstery, a power tilt/telescoping steering wheel, heated/ventilated front seats, a memory seat, push-button start, remote vehicle start, and a heads-up display. Standard safety features include a backup camera and a tire pressure monitoring system. Available features include a limited slip differential, adaptive cruise control, automated park assist, a blindspot monitoring system with rear cross-traffic alert, forward collision alert, front automatic braking lane departure warning, and lane keep assist. The LaCrosse also has available adaptive suspension with Sport Mode. 26 of 27 (96%) consumers said they would recommend this vehicle to a friend.